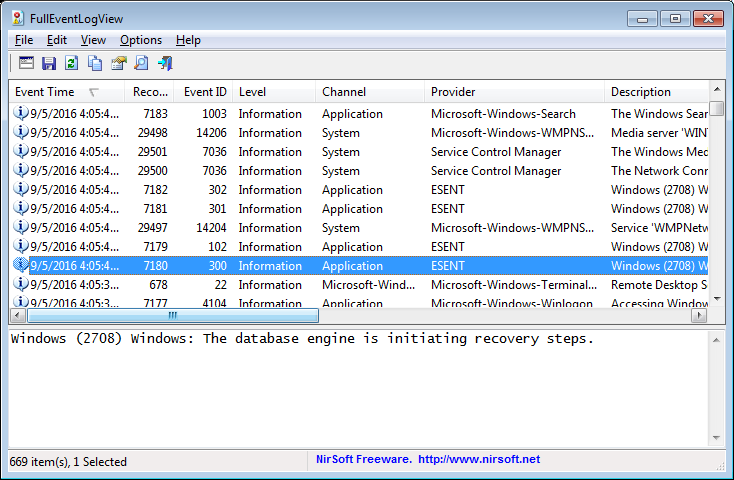 New utility that displays extensive information about all windows currently opened on your system. GUIPropView is a replacement for my very old WinLister utility and you can download it from this Web page. Posted by NirSoft on November 22, 2016 at 5:56 am under Utilities Update. You can download the CredentialsFileView utility from this Web page. Posted by NirSoft on September 29, 2016 at 2:32 pm under Utilities Update. 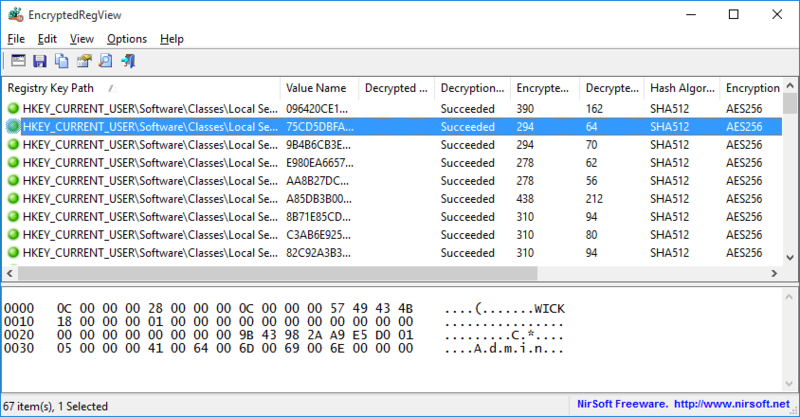 VaultPasswordView is a new tool for Windows 10/8/7 that decrypts and displays the passwords and other data stored inside ‘Windows Vault’. You can use it to decrypt the Windows Vault data of your currently running system, as well as the Windows Vault data stored on external hard drive. This tool is useful especially for Windows 8 and Windows 10, because the passwords and other security information of Windows Mail , Internet Explorer 10.0/11.0, and Microsoft Edge Web browser are stored inside Windows vault. Be aware that in order to decrypt the Windows Vault data you have to know the login password and type it in the ‘Vault Decryption Options’ window. You can download the VaultPasswordView from this Web page. Posted by NirSoft on September 24, 2016 at 5:47 am under Utilities Update. FullEventLogView is a new utility for Windows 10/8/7/Vista that displays in a table the details of all events from the event logs of Windows, including the event description. It allows you to view the events of your local computer, events of a remote computer on your network, and events stored in .evtx files. It also allows you to export the events list to text/csv/tab-delimited/html/xml file from the GUI and from command-line. 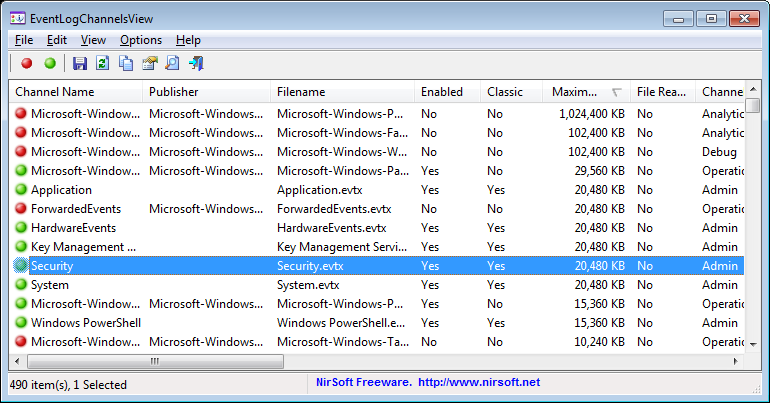 FullEventLogView is a replacement for the old MyEventViewer utility which uses old programming interface and thus it doesn’t show all new event log added starting from Windows Vista. You can download the new FullEventLogView from this Web page. 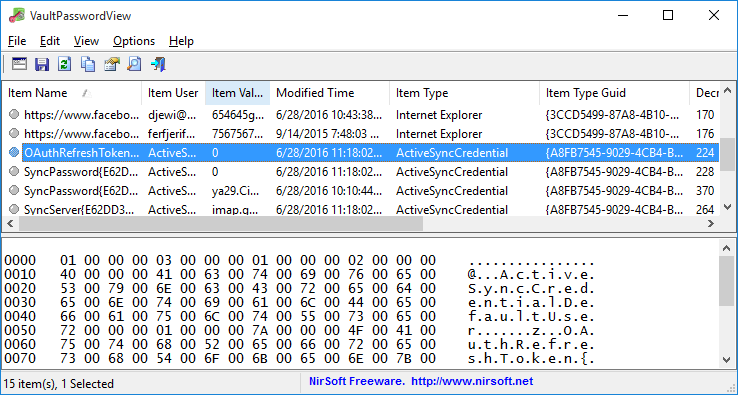 EventLogChannelsView is a new utility for Windows 10/8/7/Vista that shows the list of all event log channels on your system, including the channel name, event log filename, enabled/disabled status, current number of events in the channel, size of the event log file, and more… It also allows you to easily make some actions on multiple channels at once: enable/disable channels, set their maximum file size, and clear all events stored in the channels. You can download the new EventLogChannelsView from this Web page. Posted by NirSoft on September 12, 2016 at 5:57 am under Utilities Update. 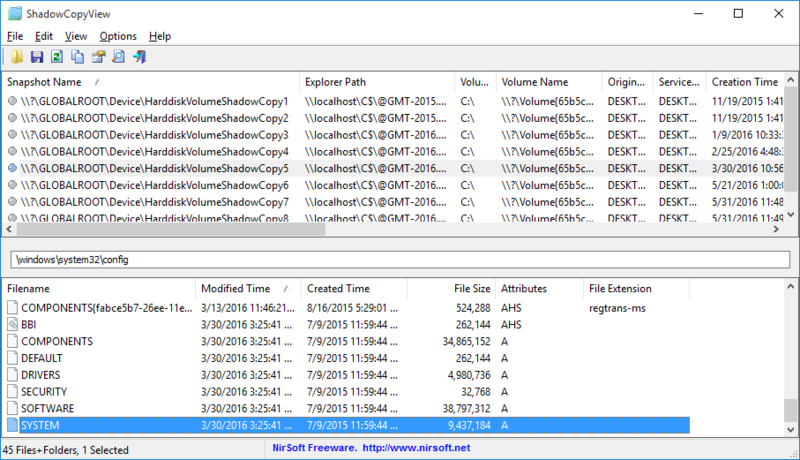 ShadowCopyView is new tool for Windows 10/8/7/Vista that lists the snapshots of your hard drive created by the ‘Volume Shadow Copy’ service of Windows. 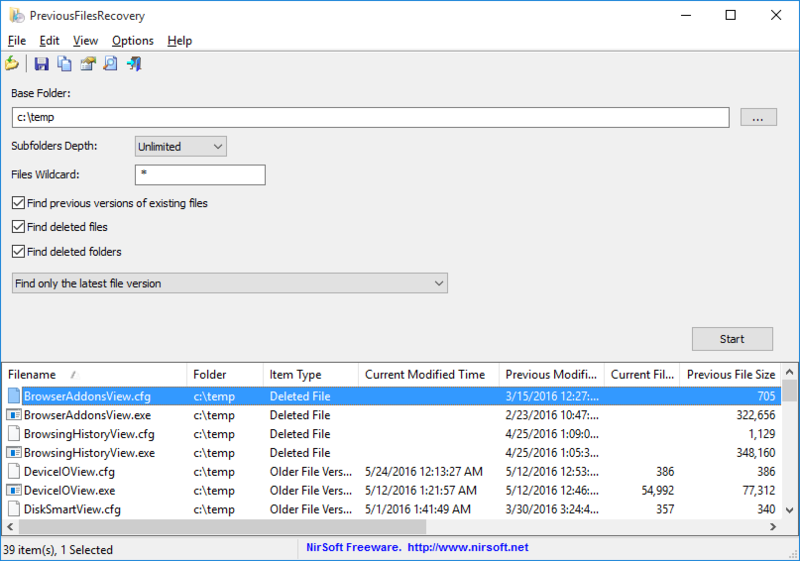 Every snapshot contains an older versions of your files and folders from the date that the snapshot was created, you can browse the older version of your files and folders, and optionally copy them into a folder on your disk. In addition to ShadowCopyView, another tool that searches old and deleted files inside shadow copies will be released soon. Posted by NirSoft on June 27, 2016 at 3:18 am under Utilities Update. 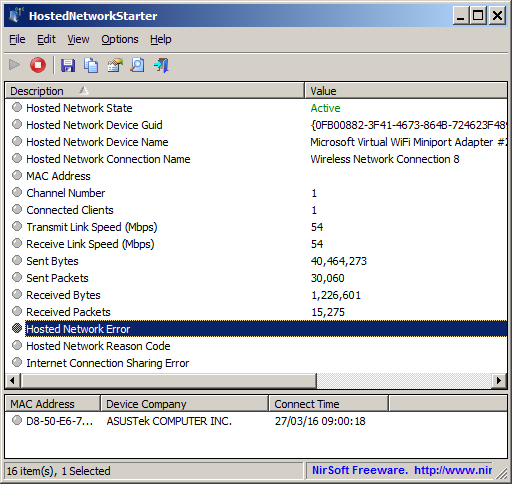 HostedNetworkStarter is a new utility for Windows 7 and later that allows you to easily create a wifi hotspot with your wireless network adapter, using the Wifi hosted network feature of Windows operating system. With the wifi hotspot created by this tool, you can allow any device with wifi support to access the network and the Internet connection available in your computer. Posted by NirSoft on April 4, 2016 at 3:07 am under Utilities Update. 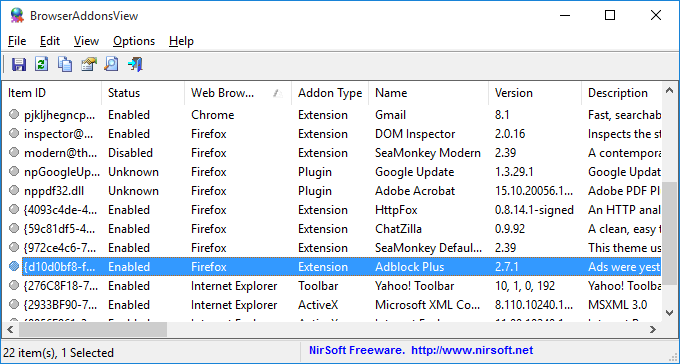 BrowserAddonsView is a new tool for Windows that displays the details of all Web browser addons/plugins installed in your system. BrowserAddonsView can scan and detect the addons of most popular Web browsers: Chrome, Firefox, and Internet Explorer. For Chrome and Firefox, BrowserAddonsView detects and scans all Web browser profiles if there are multiple profiles. Posted by NirSoft on February 29, 2016 at 3:30 am under Utilities Update. Posted by NirSoft on February 6, 2016 at 8:59 am under Utilities Update.